Posted on 13, June 2016 by EuropaWire PR Editors | This entry was posted in Art & Culture, Banks, Norway and tagged bicentenary, Einar Lie, Eivind Thomassen, Gjermund F. Rognved, Harald Bøhn, Jan F. Qvigstad, Jan Thomas Kobberrød, Norges Bank, Norges Bank 1816-2016, Norges Bank 1816-2016 – A Pictorial History, Øyvind Eitrheim. Bookmark the permalink. 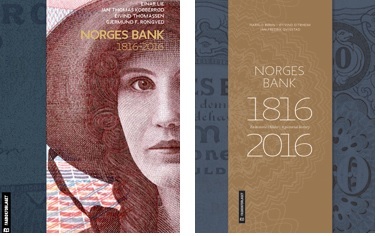 Today (10 June 2016), Norges Bank has the pleasure of launching two books written in connection with the central bank’s bicentenary. OSLO, 13-Jun-2016 — /EuropaWire/ — Norges Bank 1816-2016 is written by the historians Einar Lie, Jan Thomas Kobberrød, Eivind Thomassen and Gjermund F. Rognved. “This is the first complete history of Norges Bank written by someone outside the Bank. I think the authors did a splendid job. The book is engaging and informative, giving the reader a unique insight into an important part of Norway’s economic and political history over 200 years,” says Governor Øystein Olsen. Recent history in particular has never before been so thoroughly elucidated. Norges Bank 1816-2016 – A Pictorial History is based on the history book Norges Bank 1816-2016, and provides a broad visual presentation of the history of the central bank over 200 years. The illustrations offer a glimpse of daily life, architecture, historical events and the production of banknotes and coins. The book is edited by Harald Bøhn, Øyvind Eitrheim and Jan F. Qvigstad. Over the years, all three have held executive positions at Norges Bank. Both books are published by Fagbokforlaget, with Tone Svinningen as illustration editor and Aud Gloppen in charge of graphic design. Starting today, the books will be available from bookshops and internet booksellers throughout Norway.